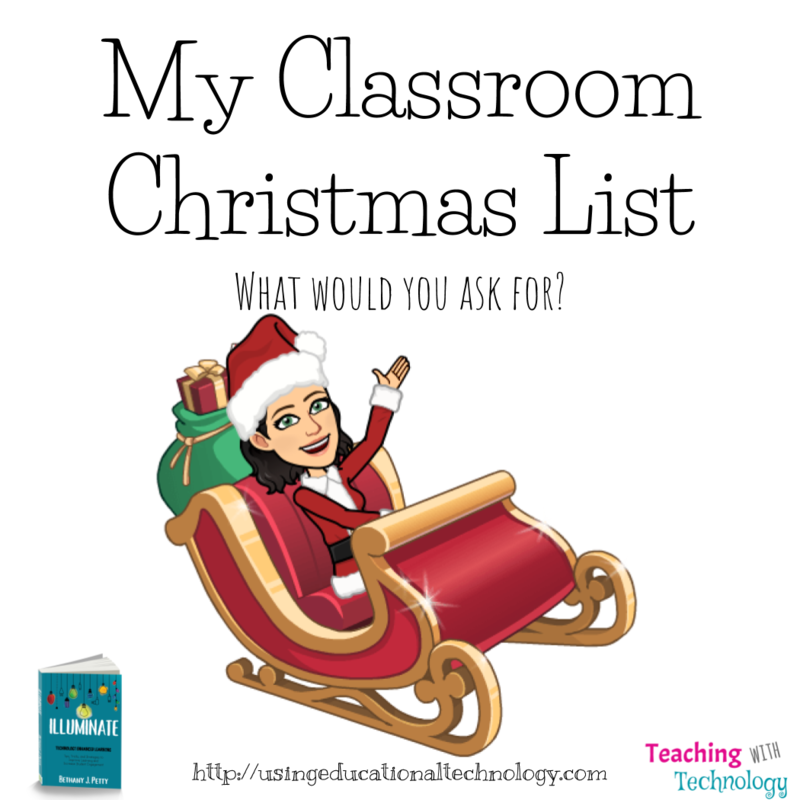 What’s On Your Classroom Christmas List? Hello, and happy Saturday! Now that my daughters are both out of school, Christmas break has officially started! We’ll be heading to my parents’ house this morning for our annual Christmas cookie baking extravaganza, which really means my sister, my daughters, my mom, and I will destroy the kitchen while my dad sneaks cookies and comments on the mess we’re making 🙂 This year, my almost one-year-old nephew (he’s pure perfection) will get to join in the fun – that is, if we can all stop fighting over who gets to hold him long enough for him roll some cookie dough or sneak a piece of candy! In addition to teaching high school Social Studies, I’m also an adjunct instructor of Educational Technology. I LOVE teaching this class because it gives me the opportunity to fulfill one of the goals of my book, Illuminate. I want teachers everywhere to know that technology is a tool that can be used to enhance student learning and NOT something that will or should be intended to replace teachers. I also want teachers to remember that technology integration is not another “thing” that teachers have to “do” in their classrooms or something that they should add to their already too long list of expectations and requirements. It’s not about the tech; it’s how you use it! One of the assignments in my class requires students to write a blog post on our class blog that describes their perfect classroom. What does it look like? What resources do you have at your disposal? If you had all the money in all the world, how would you design your classroom to best meet the needs of your diverse learners? Since I require my students to communicate and reflect using technology, I thought I should probably do the same! Also … my daughters have been making and editing (seriously, three days until Christmas!) their Christmas lists, and it’s putting me in the wishlist-making mood! First and foremost, I want to make sure I’m clear on the fact that I am VERY blessed in my classroom. I teach in a 1:1 environment with a flexible seating option and am able to flip my Government classes, blend my dual credit classes, post YouTube videos of “raps” my students and I create to help them remember course concepts, play games that normally include me standing on a table, etc. It’s pretty great. However, if I had, as I tell my students, tons of money to spend on my classroom, I would probably start by adding more flexible seating to my classroom. I would love to have bar-height tables to accommodate students who would rather stand when they work. 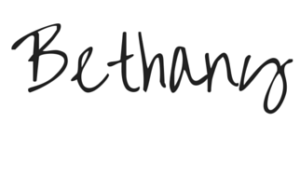 Sometimes when I’m blogging especially, I find myself standing by my kitchen counter instead of sitting at my desk or on my couch. Other times, I’m writing to you from the comfort of my recliner, snuggled up with a blanket while Harry Potter or a presidential documentary ge ntly hums in the background. This year, I had the opportunity to include bungee type chairs in my classroom. I’ve noticed, though, that when students sit in those “comfy” chairs as they’re called, they’re not able to reach our tables comfortably. This limits their workspace – while it doesn’t seem to bother most students, I would love to be able to offer them something like a coffee or end table option for their Chrombook, notebook, and other materials. As for me, I would REALLY like some sort of mobile laptop cart/podium contraption that would allow me to roll around the room, helping students when they need it while providing feedback on instructional videos, assignment submissions, etc., with my laptop. Something like this maybe? Do you have something similar? Hello, and happy Monday! I don’t know about you, but I drank ALL the coffee today. It’s that lovely time of the year when it starts getting dark a bit earlier in my neck of the woods, which always seems to translate into me being sleepier than usual. I’ll eventually get used to it … sooner or later 🙂 My Government students are beginning their Missouri Constitution and Federalism unit this week (they completed their pre-assessment and charted their data last week <– more about this soon!) 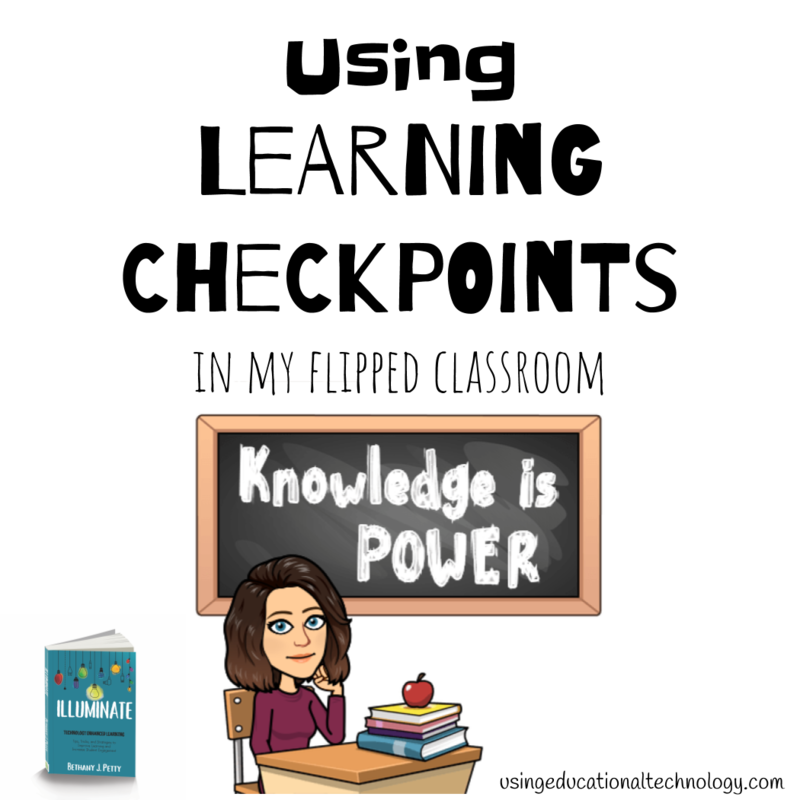 and I’m adding another application element to our flipped classroom activities … I’m calling them learning checkpoints. What are they and why am I using them? I’m so glad you asked! Toward the end of the 2017-2018 school year, I REALLY loosened my death grip on the reins of classroom learning by designing unit HyperDocs for my students (they’re juniors) and allowing them to basically proceed through our instructional videos at their own pace. This has mostly been a fantastic feature of my flipped classroom. When all of the students reached a specific point (after videos 1-2, for example) we play a game as a class to assess where my students are in their learning, what misconceptions or points of confusion they have, and to basically make sure everyone is on the same page before we move on. (Here’s the why of my learning checkpoints) We’re still doing this, but I really wanted to add another application layer that students can work through individually or with a small group which would allow me to have even more one on one (or “one to small group”) time with my students as they’re learning. Enter “learning checkpoints.” Today, when students had finished Federalism and Missouri Constitution videos 1-2, they came to me for a federalism game that I created using QR Codes. Students accessed a Google Form that I wrote on the board (thank goodness for bit.ly!) and used their smartphones to scan a series of QR Codes, each of which included a number and a specific power. Working together with a partner or small group, students scanned the code, discussed the power and came to a consensus about what type of government power (reserved, concurrent, or enumerated) was being described. They entered their answer on the form and were able to view their results immediately. When each group finished, they flagged me down and shared their thoughts with me. Then, in small groups, I was able to review the 10th Amendment, enumerated powers, the Elastic Clause, and concurrent powers with my students. It. Was. AWESOME! My goal is to create these learning checkpoint activities for students in my flipped classroom to complete after 1-2 videos to make sure they have a solid understanding of our content. Students are still able to proceed through content at their own pace but have an additional opportunity to apply what they’ve learned. WOOHOO!!! Do you use learning checkpoints in your classroom? Happy Sunday, all! I’m continuing today with my back to school planning series, and focusing on one of my favorite tools – I know I say that a lot! – Kahoot! The great people at Kahoot introduced a new game option on Twitter last week, and teachers around the world will love it! You’ll notice that “enable 2-step join” is listed as a game option. Turning this feature on will require students to jump through an extra hoop when they join a Kahoot game which will prevent (or at least drastically reduce the chances) random people from popping in your class activity! –> Answer Streak Bonus — use it and love it! –> Randomize order of questions — we definitely use this option because we review content frequently in my classroom, and I don’t recreate a Kahoot every time we review that content! –> Randomize order of answers — same as above 🙂 The point of reviewing the content we learn frequently is not to determine whether or not students can memorize which color goes with each answer option! –> Enable 2-step join — super pumped about this one! –> Automatically move through questions — nope. I do not use this feature because, depending on the responses from my students, I may spend more time discussing the content of specific questions to ensure understanding before we proceed. –> Require players to rejoin after each Kahoot — nope. I’d rather not focus on “hey what was the pin again?” as we proceed through the class period! What Kahoot game options do you use in your classroom? Happy Sunday, friends! A few weeks ago, I tumbled down the Edu-Twitter rabbit hole and found an amazing digital tool – InsertLearning! 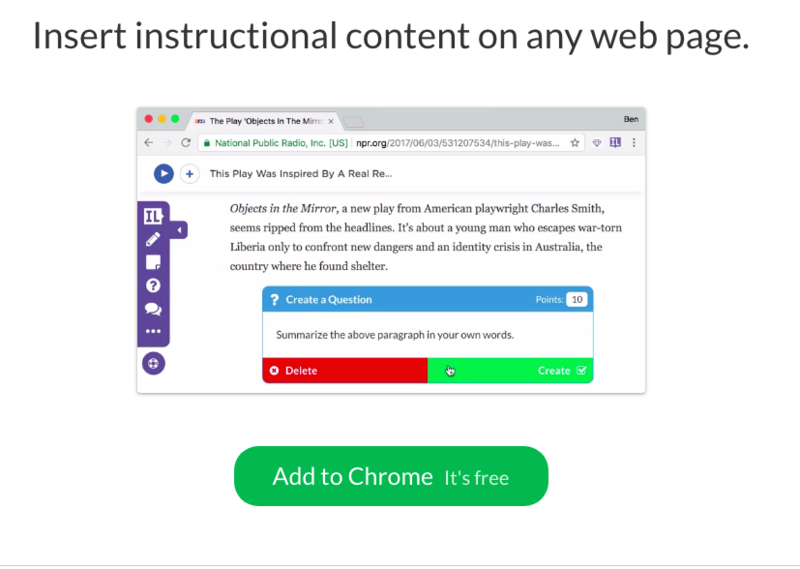 After a few minutes of digging, I realized that this is a fantastic tool that will help me design lessons around digital resources that easily integrate with platforms I already use, including Google Classroom and the fabulous Edpuzzle. What is this great tool and why am I so excited about it? I’m so glad you asked! 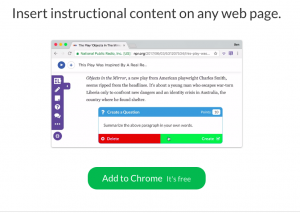 InsertLearning allows teachers to embed resources, discussions, and questions in any digital source using their Chrome extension. –> Assign the resource to your students by either creating a class section within the site or by exporting your Google Classroom sections. That’s it! Teachers can monitor student progress and provide feedback from within the InsertLearning dashboard. I have soooo many ideas swirling around in my head that involve using this tool to illuminate learning. Do you use HyperDocs in your classroom? 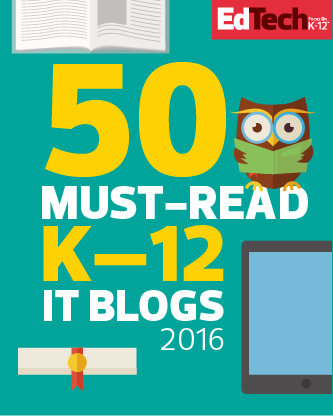 Think about how you could use InsertLearning as part of a HyperDoc! I can’t wait to use this with primary and secondary readings in my high school Social Studies classroom!! Did I mention that you can also share your InsertLearning activities with other teachers? Hello, collaboration! Users have 3 different pricing plans ranging from free to customizable for the size of your school. The individual teacher plan (which I’ll be using) is $40/year HOWEVER, teachers can “earn” free months by sharing this great site with others. 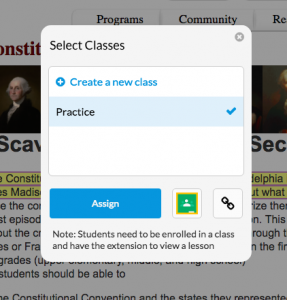 Do you use InsertLearning in your classroom? I’d love to hear your thoughts! Hello, all! It’s that time of year again … EOC review time! I, like you, am constantly trying to find new ways to review course content with my students that doesn’t only include taking practice tests – because who really likes doing that?! As I typically do when I’m brainstorming a new activity, project, game, etc., I sat on my couch with my laptop this past Sunday evening, staring at the wall – appearing to my husband as if I had finally lost my marbles! I was really visualizing how 3 ideas would work with my students. Here are three collaborative American Government review activities to use to review for EOCs or any other time during the year! Landmark cases are so important to the study of American government, but are also quite confusing and can be difficult to remember – especially if you originally learned about the case in September or October and are being tested on it (maybe) in May – that’s a different soapbox for a different day. In “Legends of Law” students work in groups to identify a landmark case based on the Constitutional issue at the center of the case, the outcome of the case, the impact of the decision on American history, etc. Students offer their classmates one “difficult” clue that, if they correctly choose the landmark case being described, they earn 5 points. If they cannot answer the question with the first clue, a second clue (worth 3) is offered. 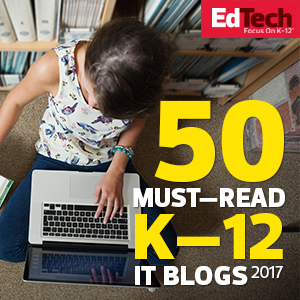 Students can work individually, in small teams, or large groups to complete this activity. As students completed their Economic Theories mini-hyperdoc, I worked with small groups of students to review cases with this game. Super-fun! Checks and balances and separation of powers are tricky concepts to learn. Each branch of government has specific powers and has responsibilities in other branches as well. Who can do what and to whom do they do it? It’s a lot to take in! Un-“Scatter”gories requires students to match powers/responsibilities of each branch of government with the appropriate branch. Start by cutting out the cards and “scattering” them on a table/desk/the floor – scattering … see what I did there? 😉 Students should study the cards and then place them in the correct category. It’s great to watch students work together to review these concepts! This game is super-simple to make and can be played in pairs, teams, or as a whole class. To create Cards of Command, I printed a Quizlet flashcard deck that I had created dealing with various types and systems of government. To create “Decks of Dough,” I printed a Quizlet flashcard deck that I made about economic terms. I cut out the cards and pitched the definitions. Just like Ellen’s “Heads Up” game, students work in pair, small groups, or as a whole class to describe the terms/concepts to a student who is holding the term card on their forehead. The descriptions MUST be given using government terms. For example, if the term is Autocracy, students cannot describe the term by saying, “the first part of this word starts like another word for car.” This is super fun to play and can be created using any Quizlet deck! We play all of these games during the class period. I divide my students into four groups and give each group one game. I set a time limit – 2 to 3 minutes – per round and have the groups keep track of their points. (Point values are listed on the Legends of Law game, and I typically assign 4 points per correct response for the other three games) Repeat the rounds as much as you wish during the class period! I hope you enjoy these collaborative review games!